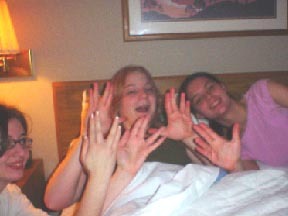 2-26-04 - WOO HOO!! Going to Prom! YEAH! Yeah, I finally worked up the courage to ask Liz to the prom. She said 'yes,' so I guess we're going together. Yay! Anyway, now I suppose we have to get all the details straightened out (what we're doing for dinner...). I don't even know where she lives! Oh well, it should be fun. One of the things I have looked forward to during my entire high school career was having jurisdiction in the area of prom. Now I have it. 'Nuff said. 2-15-04 - So, another Valentine's day has passed, and amazingly, I am still single (hmmmm... Imagine that)! Anyway, since Valentine's Day fell on a Saturday this year, we celebrated it on Friday the 13th (I personally think that's kind of ironic). We all gave each other candy, and stuff, and tried to steal the pretty females' hearts. Ooh! Something else, Melissa got a pretty stuffed bear from Brandon Weyer! Ooooh... Someone special! 2-13-04 - I watched Titan A.E. tonight. If you've never heard of it, it's a movie where the Earth is destroyed by a race called the Drej in the year 3026 or somewhere in there. Anyway, they destroy the Earth because they fear what humanity may become, and therefore swear to destroy the entire human race. There is, however a hope for them, because as the Earth was destroyed an extremely powerful ship, the Titan, capable of creating an entire planet, manages to escape and become hidden. Most of the movie is spent trying to find the Titan, so that they can make a new planet (I don't see why they can just go find some other unsettled planet). Overall, I think it was a pretty good movie, and I enjoyed it. I think, though, that the thing that got me was watching the Earth become nothing more than large chunks of rock. I mean, I don't like watching the Earth, my home and everything I know, being demolished like that. Sure, it looks cool, but then I also realize that that's my home they're blowing up. There's also something inside that keeps wondering: "what if something like that really did happen. What if the Earth isn't always here?" 1-23-04 - Well, first week of the new semester is over, and I know that this semester will be much better than the first one, because now I get to do things. Yay! Anyway, I'm off now to Brookings, SD to go and look at SDSU as a possible college, which should be fun. Anyway, peace out, and I'll be back with some more updates. 1-18-04 - Hey all. Wow, it is SO nice to just be able to sit here and not do anything. It makes me happy. See, up until now, the stress in my life has pretty much been building to critical levels, because I've been going nonstop. There, drama, contest stuff, end of the semester finals to prepare for, and most importantly, All-State Band tryouts. Well, the audition was yesterday, and now I'm pretty much done with everything for a while. Actually, it seems like my stress level has just gotten up and jumped off a cliff or something. And know what? I FEEL GREAT!! BOOYA! P.S. Megan, I'm gonna sign your guestbook and link you real soon, OK? 12-23-03 - Well, another day of updating, and this time, I didn't just add a lowsy post to my main page (though I suppose I did do that...). No siree. Also, I added a new poem to the poetry section, if Y'all haven't noticed it already. It's My Turtle Wax poem, that I created for my choir teacher, Mr. Torbert, so you should all check it out. I also updated my Fun Stuff page with a new humor thingy, called 30 fun things to do while driving. Make sure you check all that stuff out sometime. 12-22-03 - Wow, it certainly is getting closer to Christmas here... Hmmm... Yep. Anyway, now that I'm officially on my christmas break here, it's time to update. Ya. Originally, I had set aside this day to do some updating, but to my surpise, went to the third and final movie of the LOTR trilogy. It was actually very good, though it did get rather long. I think my only problem with the movie was how it ended. For those of you that have actually read the trilogy, you all will understand once you have seen the movie, because the ending of the movie, and the ending of the book are almost nothing alike... *sighs* Anyway, tomorrow there should be some new stuff up, like a new humor piece, and a new poem about Turtle Wax (if I can get it up). One other note for all you people... Even with all the hustle and bustle of this time of the year, make sure that you remember the real reason of this season. Sure it's nice to get presents (or in my case, money for a certain New York trip), but Jesus is the real reason why we celebrate. 12-17-03 - Not Sick anymore! Yay! Anyway, recently, I have been getting a whole slew of e-mails about my equation solver program on my Calculator Page. Many people have been having trouble using it because they don't know where to find the '=' sign. Well, I have the answer, which I will put into my readme file for that program. Anyway, here goes. First, you enter in the first part of the equation, making sure that the equation is relatively simplified (e.g. 2+5x-1 would be 5x+1). Once you are up to the equal sign, hit [2nd] and then [Math]. Then, you'll come across a menu, with all the equivalence signs (=, <, > etc...), all of which are compatible with the program. hit enter on the one you want and then finish typing out the equation. 10-24-03 - Well everyone, I just want you all to know that yes, I am in fact, alive. Very much alive, actually, even though it doesn't seem that way from the way Mycheesewedge has been updated in the last few weeks (try 1 1/2 months...). Anyway. During the past month and a half, my life has been excrutiatingly busy, and I have had no time to run a website, because my soul was jointly owned by the Drama club, Choir, Band, and several other school activities. UFF DA! Anyways, there are no updates this time, just this nifty little note, though I have almost nothing going on at all this weekend, which will give me plenty of time to make revisions, additions, and put other little nifties on my little corner of the web here. If any of you have any questions, comments, or suggestions pertaining to anything on my website (including any aspect of the TI-83+ calculator), please feel free to e-mail me here or at Rnelson47@lycos.com. Input you have would be greatly appreciated. 9-15-03 - Well, finally, after several weeks of having to use the library computers, we have finally managed to reformat our computer, and everything is running pretty smoothly with the internet now, so updates should be able to be posted right after I make them now. yay. Also, I have begun formulating the curriculum for TI-BASIC Tutorials that I am going to put up on this site. I'm thinking that some of the first tutorials should be done within a week or so. If you have any questions, contact me here at Rnelson47@lycos.com. 8-30-03 - Well, I've just spent my first 2 days at school (why'd they ever thing about putting a 2-day week for the first week of school? ), and perhaps I have just conformed to my new school schedule already, but it seems like summer vacation never existed, and school has just kept going. Also, now that School has started up, as well as Drama and choir (actually, auditions for our musical are next Thursday. Uff da), I probably will not have much time to be running a website, so I may not get to your questions and e-mails for a couple days, but I will get to them. 8-27-03 - Well, my school bag is packed, my new notebooks are labeled, and everything is ready for school to begin tomorrow- except for one thing: My calculator. It has become a habit since I first got it, that I erase all my memory (ARC and RAM) and start anew, just like system maintenance, or something like that. Hmmm... It seems that I have just forgotten what I was wanting to type, so I guess I'll just stop here. Uff da. Well, it is currently 10:58 p.m, and I have spent about an hour or so doing some real updating. It took a while, and the changes may not be all that noticeable, but it I've found that it really gives you a good feeling to sit back, look at those improved HTML documents, and say: "Oh yeah, that definitely looks a lot better." Besides, the website really needed it. I am now very pleased to announce the addition of a couple new pages, including the Star Trek humor page I have been talking so much about for a while. Only it is not just a Star Trek humor page, it contains everything I find that has to do with Star Trek that I am not lazy enough to put up. 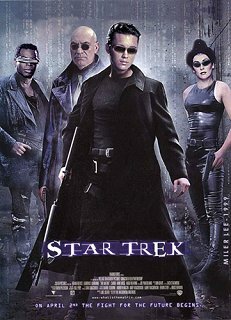 Everything on this site that has to do with Star Trek on this site will be on the Star Trek page. Also, since this page has been in existence, I have often posted my updates, or just things that everyone has to know (see below) right here on the main page. However, for about 3 months now, this list of postings has grown considerable longer and longer, so that it seems endless. Anyway, I have put old news up on a new page that I call 'The Archives.' There, you will find all the 'old news' for this site (it's actually kind of interesting to look back at my first postings, and then to the more recent ones. It sort of shows how I (and the website) have developed as I became more comfortable with HTML (my coding has become a lot better). Quite interesting). 8-6-03 - Hmmmmm... Well, all is well here in Sturgis, or is it? Two days ago, the Annual Sturgis Bike Rally began, and Sturgis has been covered in an impenetrable aura of motorcycle sounds that never cease! So, ever since the bikers (and the venders) have taken over our town, the actual residents are either (a) getting a job for the Rally, (b) Going on vacation (or c) cowering in their homes in a fetal position. Being one of the more courageous ones, I found a job working in the kitchen of a campground, run by a family that goes to our church, and it isn't a very bad job at all. On a different note, I was recently probing my belly button on an archaelogical dig, where I discovered something I had never seen before, and was therefore compelled to write a poem about it. I call it The Thing... You should all check it out. Oh yeah. Saturday August 2, 2003 (Stardate 47734.2)-Well, I am back from honor's choir, and I think that it had to have been one of (if not THE) best choral experiences I have ever taken part in. It was SO MUCH FUN!!!! I made several new friends, and I know the friends that I already had a lot better now. And when we (the choir) sang together for the very first time, I thought: 'Woah! We sound really good!' Our conductor was really cool. He was always smiling, he knew exactly what he was doing, and he can do hand stands. In fact, I think it was one of my friends who said that he could be described as "the living embodiment of Mickey Mouse." The entire week was really cool, and when the final practice of the night ended, all the counselors had some pretty nifty stuff lined up for us. Let's see... On Tuesday, we had a dance, and everyone was there! (the fact that everyone was forced to attend so that they knew where we were is not important.) The dance was a lot of fun, and I managed to become deaf by hanging out with my friends by the huge speakers (I just love bass). The dance started out really good, because I knew most of the songs. But then, there was music that I didn't like and/or know, so I went into the hall and spent the remaining time playing card games with friends that don't do dances. Overall, it was a really great night. Saturday, July 26th, 2003- Hello again. I am just posting here to update a few things, and to let you all know that tomorrow, I leave for the South Dakota Honors Choir, so I will be gone for about a week. Also, when I get back, Sturgis will be in the very middle of its annual motorcycle rally. I'm have a job then (what youth doesn't? ), so I may not be able to post then either. However, I have several new sections planned, so when I get back, I will work on them. Just wanted you all to know. 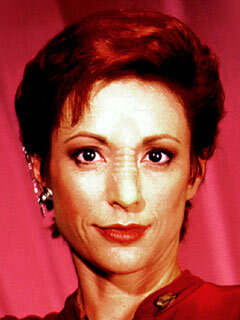 The second birthday we have is Nana Visitor, who played Major Kira Nerys in Star Trek: Deep Space 9. You have been using the English language for your entire life, but then suddenly, this radical comes along and says we should switch the entire world to a new language called 'BAC�K,' which is better because all words are spelled exactly as they sound in all cases, no silent letters, and no exceptions whatsoever. 6/19/03- Hello, all. What a day today. It turns out that I need to change the configuration of my website quite a bit, so that the popup ads don't take over your computer. Originally, this site used frames, and those little bar ad thingies at the top of the screen instead of pop-ups. However, Tripod puts a little bar-ad in the top of each frame, leaving an unsightly half a bar-ad thingy at the top of my menu window. After much work and thinking, Mycheesewedge became what you see now. However, the pop-ups are horrible, so yet again, for the third time in two weeks, I am redesigning my website's layout. Peace out. 6/17/03- Alrighty, after two days of work, I have finally gotten my website somewhat presentable (even though it still has lots of work to be done on it). Anyway, let me welcome you to Mycheesewedge.tripod.com, my own little corner of the internet. There isn't much up yet, but feel free to peruse around at your own speed, and make sure you sign my guestbook. Well, that's all for now. Later!